When my friend Cyndi asked me if I’d rather see the Great Ocean Road or see the Little Penguins, the decision was an easy one to make. After only getting to see one penguin in New Zealand, I was ready to see more. And on Phillip Island, I was guaranteed to see many. If that weren’t enough, Phillip Island is also home to the Koala Conservation Centre where I met even more of Australia’s wildlife. After penguins, I saw koalas, wallabies, and tons of exotic birds some of which laughed us right out of the park! Only an hour and half South of Melbourne lies Philip Island. Cyndi and I arrived in the evening with a few hours of sunlight left before the penguins came out. We decided to take a walk at the Nobbies. The Nobbies boardwalk stretches along the Southern coastline at the Western tip of Phillip Island. There are views of Seal Rocks, an outcrop where the largest colony of fur seals in Australia dwells. There’s also tons of birdlife. We saw plenty of varieties of bird but the most impressive had to be the Cape Barren Geese. These guys looked so prehistoric! I loved their spotted feathers and bright yellow beaks. The Blowhole is another attraction here. Near the end of the boardwalk, a cavern in the rocks makes a thunder sound when there are huge southern swells. The swells were powerful enough when we were there that we could hear the thunderous clap of the waves. As sunset approached, we made our way to the Nature Park where tickets to see the Penguin Parade cost about $25 per person. The Penguin Parade is a year-round nightly event where sometimes hundreds of penguins emerge onto the beach and make their way up to their burrows in the grasses. We were lucky enough to see about 100 of them on this cold night. They are called Little Penguins—sometimes “Fairy Penguins” in Australia and “Blue Penguins” in New Zealand. I think Little Penguins fits them best. They only grow to be slightly over one foot in height and they weigh just over 3 pounds (about 1.5 kilos)! My camera could barely capture them as they speedily waddled up the beach with only dim flood lights shining to give tourists a glimpse. We weren’t allowed to use flash on them so these blurry shots are the best I could do. Little Penguins are survivors. They raft up together and wait for nightfall before heading home because darkness gives them cover from big predatory birds. Otherwise, penguins would be the perfect sized bedtime snack! Half the show can be seen from bleachers the Park has set up on the shore for all the paid viewers. We spotted the penguins popping up out of the water and onto the beach in groups. They waited there to let the rest of their group catch up and to scout out their course. Then all of a sudden—they’re off! They lean forward and scurry up the beach and into the dunes. The second half of the show can be seen from the boardwalk leading through their burrows. They race alongside the boardwalk to the location of their lifelong home. In my opinion, the boardwalk was the best place to be to see the penguins! They ran along right next to us—too cute! Not considered endangered, these penguins really have it good. The money from the tickets goes to support them. Some of their homes even have been built up with wood planks to better sustain them. I wondered when they’d be getting Netflix in there. Also on Phillip Island is the Koala Conservation Centre. 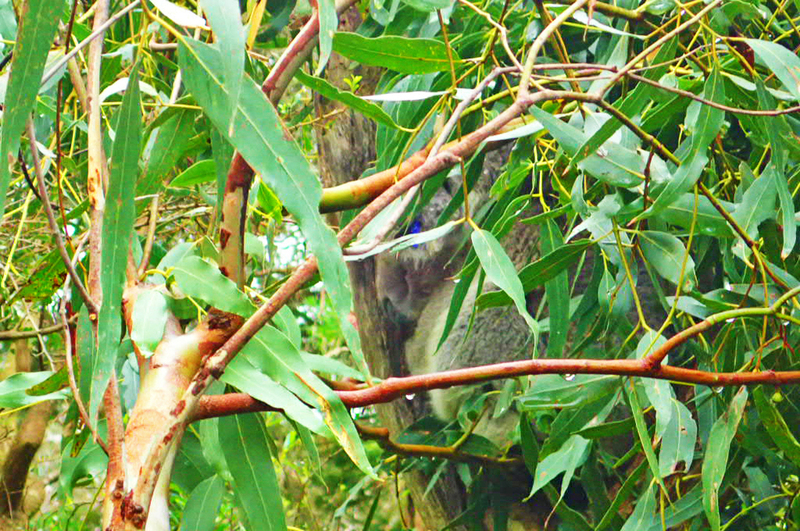 Unlike zoos, the Conservation Centre offers visitors a chance to view koalas and other animals in their natural habitats with little disturbance to them. Of course, some people still need to be reminded not to bother them! The morning after the penguin parade, we paid a $15 fee to enter the park where we wandered treetop boardwalks and pathways to spot the animals ourselves! Finding koalas was a little tougher than I thought it would be. They mostly sleep during the day and do so way high up in the gum trees. Luckily, the rangers walk through in the mornings and place markers where they were seen last. So we knew where to look. Once I spotted the first few, it became easier. Especially with the more active (and itchy!) ones. They take breaks from napping to eat eucalyptus which is their only source of food and energy. No wonder they sleep most of the day away. Here’s a little compilation I put together of the koalas we saw moving about. The one close up I got of the koala itching himself is of an older adult. Gramps there was lower on the branches because when they age their teeth get worn down and they can’t chew eucalyptus as easily. So he stays down low where he requires less energy to hang out. Are any of my readers fans of the old Niceklodeon show, Rocko’s Modern Life? I used to love that show. I always thought Rocko was a kangaroo until the episode where he corrected everyone that he’s a wallaby! Wallabies are basically small, multi-colored kangaroos and they can be spotted all over Australia. I saw tons of them on the roadside during my road trip North to Cairns. But the only time I ever saw wallabies up close was at the Koala Conservation Centre on Philip Island. The rangers likely walked through in the morning to knock down the leafy branches they like because there were so many wallabies around nibbling away at them. In one area, we spotted a group of 6-8 wallabies including a young one. He was no longer small enough for the pouch but he was a little rascal! I had never seen these guys in real life before. If you haven't been to Australia, I bet you haven't seen them either. “Kookaburra sits in the old gum tree. Ever hear this song before? I definitely have. I was singing it in my head over and over again after visiting the Koala Conservation Centre because of all the Kookaburras we saw—and heard! Tons of unique and colorful bird species, like Galahs and Cockatoos, were at the Centre. There were also a plethora of Kookaburrahs. And did they LAUGH! Now I understand that song. The wildlife on Phillip Island was like nothing I had seen before in my travels. I was only there for about 24 hours, but the animals were adorable, exotic, and oh-so-Australian! It left me thinking, "Yep. I'm in Australia." Thanks again to Cyndi for getting us to Phillip Island and being my guide. Good times!